For groups, our cancellation policy is 5 days advance notice. If you cancel with less than 5 days notice or are a no-show, we charge you the full amount of the reservation. If you cancel with more than 5 days notice, there is no charge. If you reduce #'s more than 5 days in advance = no charge, less than 5 days notice = no discount. Beautiful budget hotel & mid-range property in the heart of our colonial city. We offer everything that you could need during your stay in Antigua: cable TV, internet, international phone calls, a kitchen, travel desk, hot water, daily maid service, laundry service, bag storage, Spanish classes, etc. Our goal is to make your stay as comfortable as possible, whether you want to relax or you want to explore the city. Our great location, 2 blocks from the central park, close to all the important sites, but far enough away to give you a very peaceful rest. • Pet friendly, accepting your pet for $5 a pet a night, max. 1 pet per room. Our rooms & common areas are decorated with beautiful Guatemalan furniture & textiles. They are spacious with lots of light & bright colors. They have beautiful tile work & many nice extra touches that you would'nt expect in a mid-range hotel. All rooms come with private bath, cable TV, hot water, linens, towels, soap & window views. Depending on availability: Doubles can be with 1 large bed or 2 separate beds. Triples can be with 2 larges beds or 3 separate beds. Quads can be with 2 or 3 large beds or 4 separate beds. Depending on availability, rooms can be on 1st, 2nd or 3rd floor. 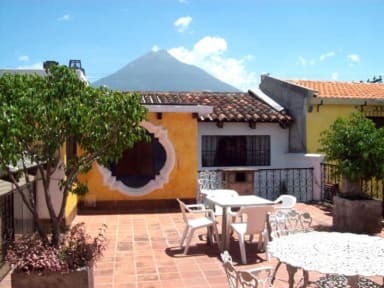 We also offer a Travel Agency, use of a fully equipped shared kitchen, laundry service, bag storage, Spanish classes, large terraces with sitting areas, a garden with a trickling water fountain, a breakfast sitting area & a wonderful reading lounge. Our bi-lingual staff will help you with all your needs & give you good tourist info. For families with children, we provide pack-n-plays, high chairs & a baby friendly environment. for $37 (1 to 3 people). $8 per person extra. For this service, please write us an email. Our cancellation policy is 3 days advance notice. A reservation should be cancelled 72 hrs in advance before the check in time. Otherwise, for any late cancellations or no-shows, you will be charged for the 1st night. The hotel accepts US dollars, Quetzales, Travelers checks & credit cards. If paying with credit or debit card, there is a surcharge. Cancellation policy: 3 days, if needed, a reservation should be cancelled 72 hrs in advance before the check in time. Otherwise, for any late cancellations or no-shows, you will be charged for the 1st night.